When webOS 1.0 was released, swipe-to-delete was an extremely important "gesture" that you needed to know in order to properly navigate the OS. How else were you going to delete items from a list? 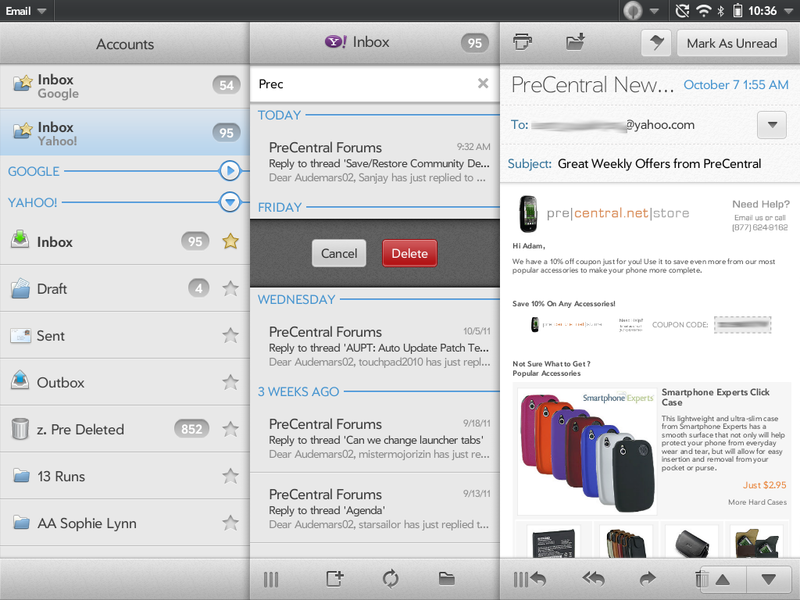 While webOS 3.0 on the TouchPad added in the ability for mulit-select (for example, to delete multiple emails), swipe-to-delete still plays an important role on many apps on the TouchPad (it even still works in the email app). However, there is one BIG difference in how swipe-to-delete works in apps coded in Enyo on webOS 3.0. Unlike in earlier iterations of webOS, you can no longer auto-confirm a deletion by swiping off another item. Instead of the previous item being deleted, nothing happens. That previous item just returns back to its status prior to swiping it off the screen. So, you now need to press "Delete" for each item to delete. Note: App coded in Mojo--even full screen Mojo apps--will still support auto-confirm for deletion on the TouchPad. It's only Enyo apps that do not.